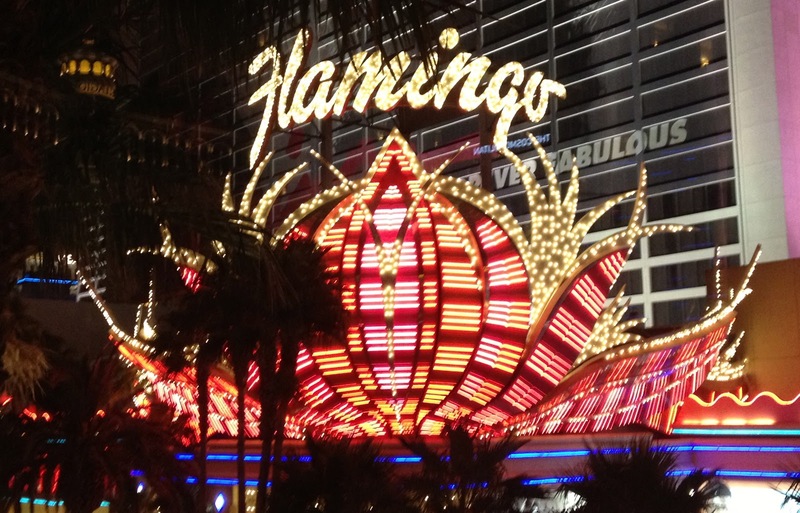 Friday was a pretty quiet day; Ed had more meetings which took up most of the day, and was pretty tired by the end of them, so Friday consisted of getting ourselves to...the Flamingo. We were both too full from lunch, so we stopped off at the Forum Shops at Caesars Palace, had a light dinner before wandering around the Bellagio's Conservatory and Botanical Gardens, and saw the fountains at the Bellagio. Today was the night in which had the most fun. We finally saw the flamingos (by the time we'd gotten to our hotel and were in a position of wandering out to see them on Friday, it was dark and we didn't get a good look). We wandered over to the Palazzo, had lunch, and admired the gondolas at the Venetian, which we had contemplated riding, but we changed our minds. Mostly we sat around (my feet were ready to fall off) before going to Mass. We had a truly amazing dinner at Carnevino, where we ate very well, and then headed back down the Strip (which we went up and down four or five times by the end of the day) to the Monte Carlo theater to see the Blue Man Group. We really had a good time.